For something that fits in your hands, the Saint Laurent Classic Toy Sac de Jour Shoulder Bag is packed with immense style. We are truly dwarfed by what this tiny babe could offer. If you’re up for something classy, then this is sure to be your next best bet! Get your very own Toy Sac de Jour now! How small is small when it comes to Saint Laurent’s Classic Sac De Jour? From the regular SDJ that’s good for work to the Nano that measures a wee 22 cm across (there are 4 sizes in all, by the way), the size I’m adoring the most that’s small but not too small (yes, there is such a thing when it comes to bags, no?) is the one that’s appropriately named Baby. One up from the Nano and coming in at almost 26 cm across, the Baby Classic Sac De Jour is in my opinion the one you’ll have to get if you’re looking for a good city-sized bag, one that’s big enough for the day’s essentials, but not too big until it becomes a convenient dumping ground for things you don’t need in the first place, which I have witnessed for myself when I poked around in some women friends’ bags, from three mini umbrellas (really, who needs 3 umbrellas?) to 7 lip balms gathered at the bottom of the bag. Wear it by the sling or just use it via its top handles, the Baby Classic SDJ is priced atSGD3190. Yes, I know, it’s not cheap right? Then again, what luxury bag is nowadays, so you might as well spend your hard-earned money on something you really love, yes? It’s available in grained or smooth leather variations, although I’m always partial to anything grained since in my books it would mean it would hold up to accidental nicks and scratches better. However, that would be your choice at the end of the day, as would be the colour you pick, be it Lipstick Fuchsia, Royal Blue and Yellow. Sometimes, big, chunky bags could be too overwhelming and heavy (we hear you, lady!). The stress of everyday life could take the pleasure out of carrying your ol’ faithful – that large designer tote of yours could do a few days off! And well, we sort of know just the trick…presenting, the Saint Laurent Micro Mini Sac de Jour Bag! Trust us when we say that this teeny baby’s got game. This stunner in beautiful croc leather needs no introduction…and judging by the material on this piece, we could say that it really is a winner! See how it fits in your hand? There’s something about miniature pieces that we couldn’t point a finger at, still we love them just the same! Classy, never trashy, this Saint Laurent piece is sure to become your next favorite. It has adequate space for your evening baubles, just the way you like it. 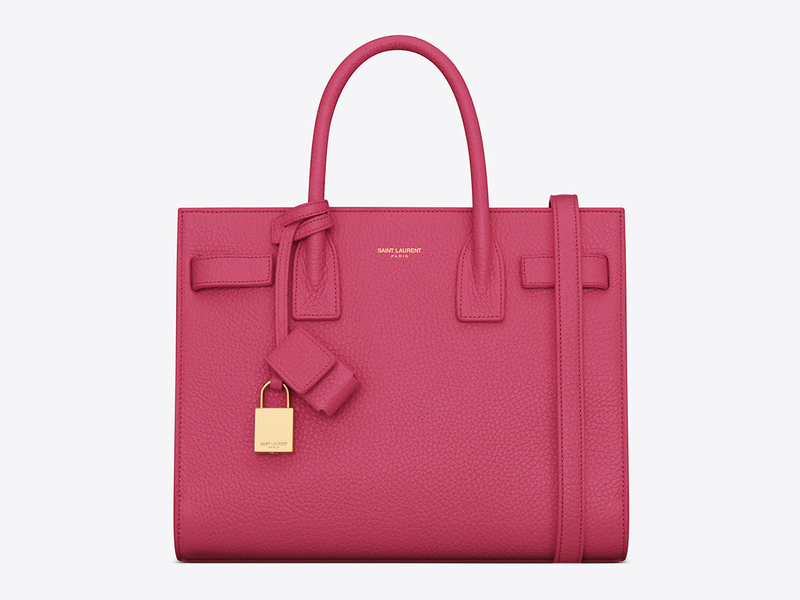 Priced at around $1,600 USD, get your very own Saint Laurent Micro Mini Sac de Jour Bag now! Saint Laurent is doing evil things, they are pushing on our most vulnerable button – our obsession for designer bags. They are so-guilty. Let’s gather the evidence – Saint Laurent Mini High School Bag, Saint Laurent Classic baby Monogram Punk Chain Bag and the newest Large Shopping Tote. All of these bags are from the latest collection and they are beyond gorgeous. Now the latest iconic bag with a little twist, the Saint Laurent Classic toy Sac de Jour, it’s in the mini-size ladies! Omg, tiny and classic, how can we resist. WE CAN’T! The Sac de Jour Tote Bag is one of the most hunted bag in the world and refined in Crocodile Embossed leather to enhance the luxurious-impact. As tiny as it is, imagine how cute it is to shoulder it around town and at parties. You are warned if your friends get jealous. The shoulder strap can be removed easily, it features a removable leather encased padlock. The keyring with padlock keys are affixed to the interior with a snap. Do you see the oversized lock? Underneath it reads: ‘Saint Laurent Paris’. Gosh, my heart just skipped a beat. Crafted from calfskin, it’s measured 5.5’ x 4.3’ x 2.8’ inches, the length of the handles is 1.8’ inches, shoulder strap has a drop of 63 cm. Priced at $1350 USD, 950 euro via Saint Laurent boutique or e-store.